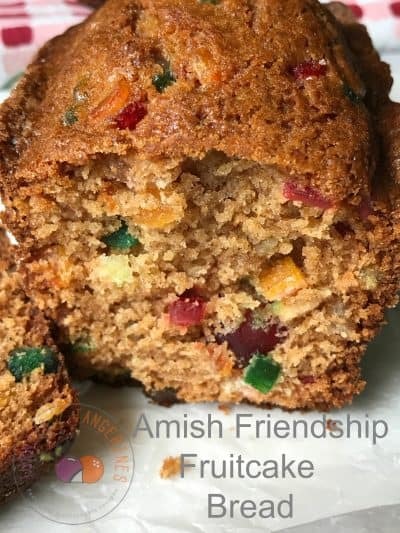 Amish Friendship Fruitcake Bread is made with Old English Fruit and Peel Mix by Paradise Fruit Co. and an Amish friendship bread starter. Making a friendship bread starter is really easy to do. Once you get it started, you will be able to make so many delicious breads, muffins, scones, cookies and so much more. Your biggest problem will be to find family and friends to give your starter away too, once its established. 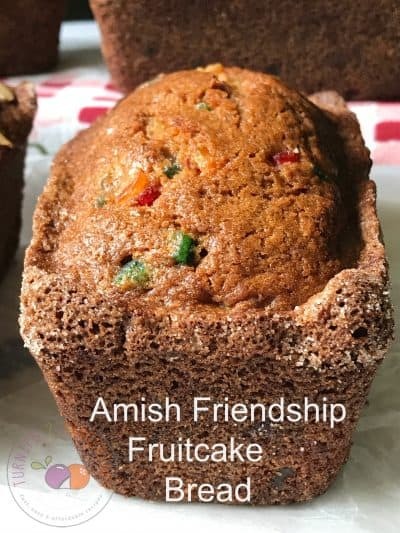 For all of your Amish friendship bread questions, recipes and everything you will ever need or want too know about Amish friendship bread, visit: Friendship Bread Kitchen. This is a fantastic website, with over 250 recipes plus so much more. You will be surprised at all of the wonderful and delicious things you can make with your starter. Winter is the perfect time to start and maintain an Amish friendship bread starter. You’ll be busy baking all winter long. 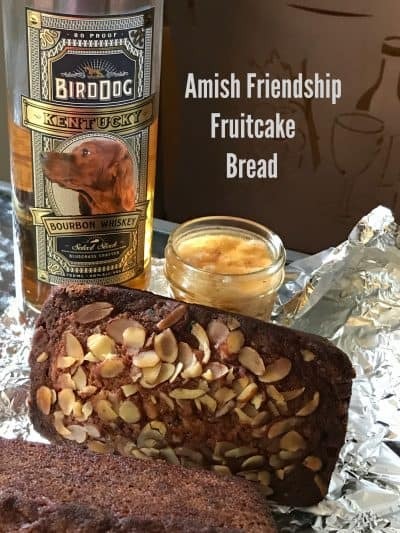 Amish Friendship Fruitcake Bread is made the old fashioned way, by soaking or wrapping the bread in cheesecloth that has been soaked in brandy or in this case, Bird Dog Whiskey. We decided to let the wrapped bread ‘cure’ in the refrigerator for 18 weeks but if you don’t want to wait that long, 12 or even 6 weeks will be fine. The longer the bread is wrapped in the brandy soaked cheesecloth, the more pronounced the flavor will be. Can I say delicious here!! Traditional winter holiday cakes made with an assortment of candied fruit and fruit rind, nuts, spices and usually liquor or Brandy. Fruitcakes can have a moderate amount of cake surrounding the chunky ingredients, or only enough to hold the fruits and nuts together. Fruitcakes fall into two categories; Dark fruitcakes and Light fruitcakes. 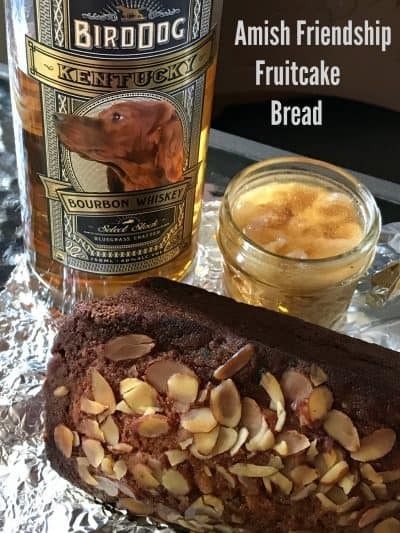 Dark fruitcakes are generally made with molasses, or dark brown sugar and dark liquor such as brandy, bourbon or whiskey. Dark-colored fruits and nuts such as prunes, dates, dark raisins, and walnuts are used. Some people prefer using a dark rum. Spiced dark rum or flavored brandies would also be a great and different flavor choice. Light Fruitcakes are generally made with granulated sugar, light brown sugar or light corn syrup. Light ingredients such as almonds, dried apricots, dried pineapple and golden raisins are used. The liquor if choice is rum. With the new spiced rums and brandies on the market today, the flavor combinations are endless. All fruitcakes are baked slowly and after cooling, usually covered in cheesecloth moistened with liquor, brandy or rum and tightly wrapped in foil. Store in this manner, fruitcakes have tremendous staying powder and providing they are occasionally re-moistened, can be kept for years. This fantastic bread is made with Paradise Fruit, Old English Fruit and Peel Mix. Amish Friendship Fruitcake Bread gets wrapped in brandy soaked cheesecloth for 18 weeks. 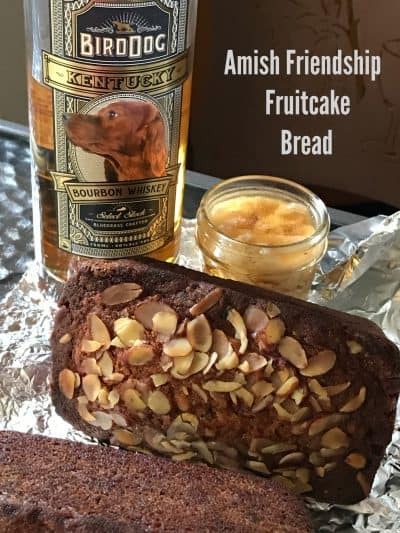 Course: Amish Friendship Bread, Bread, Christmas, Paradise Fruit Co.
Keyword: Amish Friendship Bread, Bread, Paradise Fruit Co. In a large mixing bowl, add ingredients as listed. Mix together until combined. Grease two loaf pans. *We used 2- 8 x 8-inch loaf pans. Dust the greased pans with a mixture of ½ cup sugar and 1½ teaspoons cinnamon. Pour the batter evenly into loaf pans and sprinkle the remaining cinnamon-sugar mixture on the top. Scatter sliced almonds of top of bread batter. Bake for one hour or until the bread loosens evenly from the sides of pans and a toothpick inserted in the center of the bread comes out clean. Remove from oven, let bread cool in pans for 10 minutes. Remove bread from pans and let cool on wire rack until completely cooled. Pour 1/4 cup brandy into a small bowl. Cut two pieces of cheesecake, large enough to wrap each loaf of bread in. Place cheesecloth into brandy. Let cheese cloth soak in brandy for 2 hours minimum. Remove cheesecloth from brandy, do not wring out brandy from cheesecloth. Discard brandy. (I guess you could drink it?!?) Wrap each loaf of bread in brandy soaked cheese cloth. Wrap bread in plastic wrap and then foil. Place wrapped breads in a large storage baggie. Refrigerate six weeks and repeat process, using the same pieces of cheesecloth. After 18 weeks, your bread should be ready to be enjoyed. For this recipe we used Bird Dog Whiskey and Paradise Fruit Co. 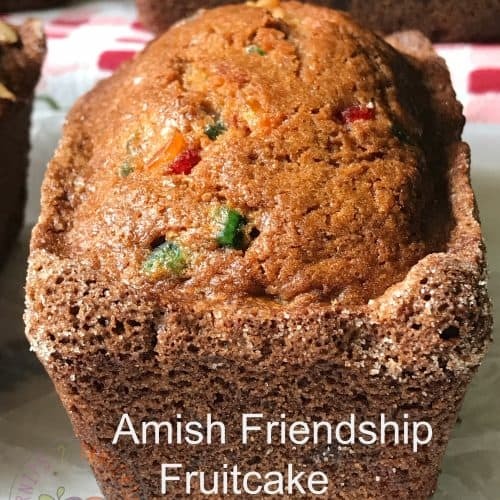 Looking for more Amish Friendship Bread recipes? Try these: Triple Ginger Cranberry Friendship Bread, Amish Friendship Bread Lemon Poppy Seed Biscotti and Cranberry Amish Friendship Bread.